Just yesterday, we covered how Tom Cross was endorsed by the Quincy Herald-Whig in his race over Mike Frerichs for Illinois State Treasurer. That was the 2nd endorsement - with the first being the Daily Herald also picking Tom Cross in the race. 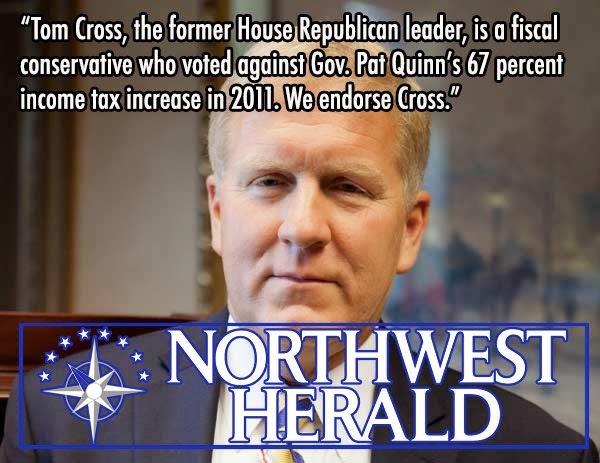 Today, Tom Cross picks up his third endorsement - this time from the Northwest Herald. They cite his vote against Pat Quinn's 67% income tax increase and his focus on a balanced budget. The endorsement can be checked out on Tom Cross' campaign site here. With no incumbent on the Nov. 4 ballot, Republican state Rep. Tom Cross of Oswego, Democratic state Sen. Mike Frerichs of Champaign and Libertarian Matthew Skopek are vying to replace Rutherford. Cross, the former House Republican leader, is a fiscal conservative who voted against Gov. Pat Quinn’s 67 percent income tax increase in 2011. Cross said he will use the office to force the General Assembly to follow its constitutional requirement to pass a balanced budget each year, even if it means filing a lawsuit. Go get a yard sign from Tom Cross by visiting his action center here: http://www.jointomcross.com/yardsigns.